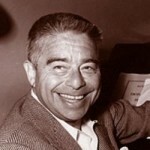 Alfred Newman was an American composer, arranger, and conductor of film music. In a career which spanned over forty years, Newman composed music for over 200 films. He was one of the most respected film score composers of his time, and is today regarded as one of the greatest musicians ever to work in film. Newman also conducted the music for many film adaptations of Broadway musicals, as well as many original Hollywood musicals. He won Oscars for adapting the scores of such noted musicals as The King and I, Camelot, and Call Me Madam, as well as for adapting the songs in such Hollywood musicals as the Betty Grable vehicle Mother Wore Tights. Newman won nine Academy Awards, the most of any composer. He was nominated a total of 45 times, making him the third-most nominated person in Academy Awards history after Walt Disney and John Williams.